I really fell in love with Laos. From the moment we hopped on the slow boat from Northern Thailand, there was just something so natural, rugged, utterly untouched that stirred me up in all the right ways. 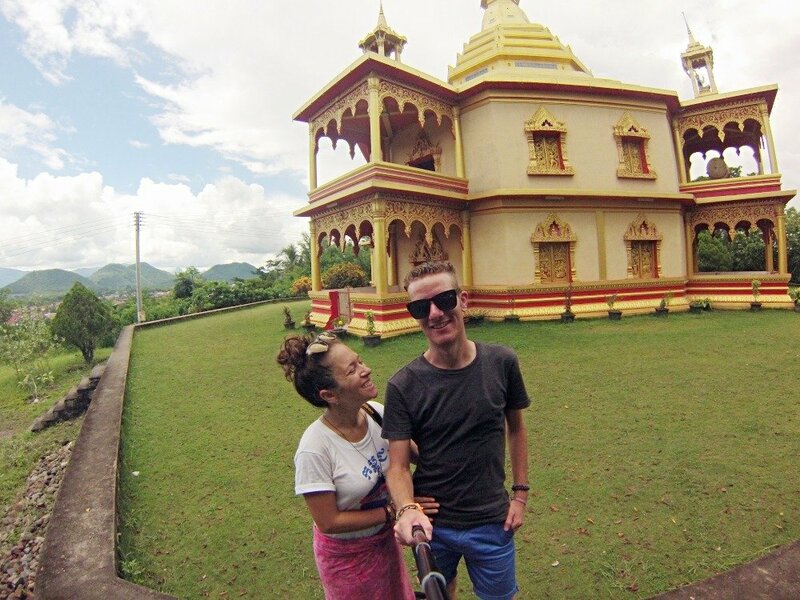 We spent 30 days in Laos traveling from the center to the North, back to the center, and then south. Then sort of back up a bit again. It was kind of a pain, but totally worth it. I hope this 30-day itinerary of Laos helps you plan your trip. Whether you’re going for a week or more, I love noseying around at what other people did on their trips and stealing my favorite parts. Steal away – Laos is an incredible place and if I can convince you to spend a bit more time there than you initially planned, awesome. We spent the night in Chiang Rai, Thailand so that we could wake up bright and early to catch all the right connections. It’s really simple to do on your own (although you can do it through an organized tour if it makes you feel more comfortable). You take a bus from the Chiang Rai bus station to the Laos border. Then you take a shuttle bus over the friendship bridge. Everyone knows where the tourists are going on this route so there are plenty of shuttles and tuk-tuk drivers helping out/taking your money along the way. Once you pay for your visa, there are trucks waiting to take you to the ferry. It’s all pretty well organized these days. You’ll take the boat all day. It was the rainy season when we were there (end of July), but it was still so beautiful. If you love simply looking out at natural beauty, reading books, playing card games and talking to your fellow travelers, you’ll love the slow boat. It’s pretty much all tourists and backpackers. 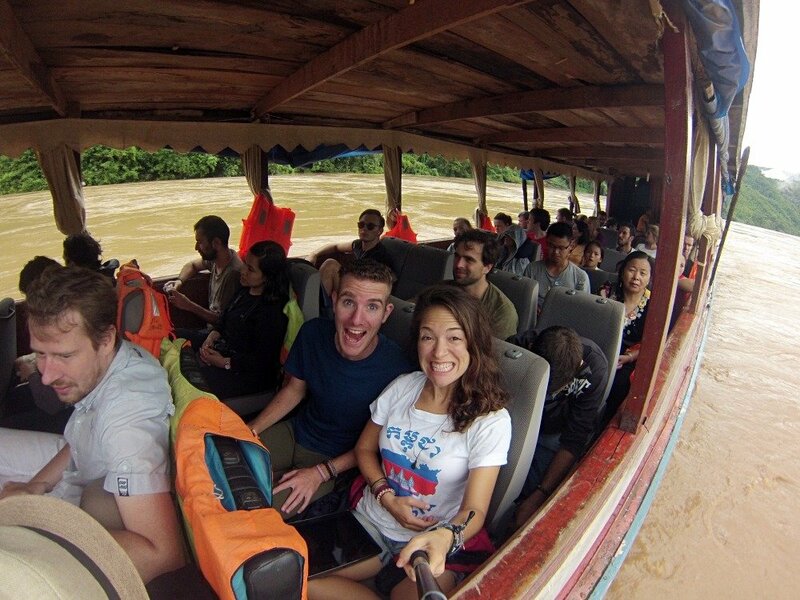 If you’re looking for a “local experience” this ain’t it, but it’s a great and reasonably priced way to explore the Mekong. The first night you get out at Pakbeng. There are plenty of places to stay for very cheap – a few dollars for your own room plus breakfast and a packed lunch for the next day is usually included. Then another day in the boat. It’s equally as beautifulmesmerizingizing. Everyone knows each other by this point so there’s a bit more chit-chat amongst the group. They sell beer on the boat which makes things pretty fun. You’ll arrive at a random port outside Luang Prabang and pay a few dollars for a shuttle that will take you to the center of town. I know everyone raves about Luang Prabang, but if I’m being totally honest, it was probably at the bottom of the list if we’re ranking my favorite places in Laos (just above Vientiane). 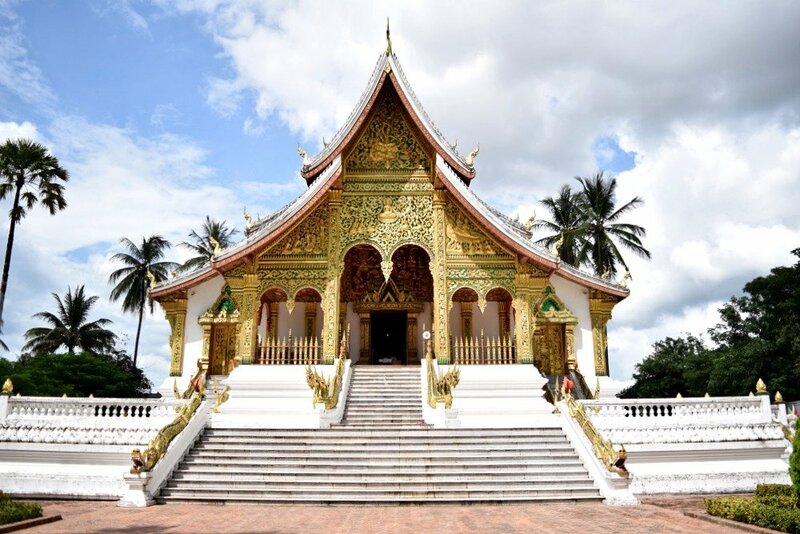 There is a lot of things to do in Luang Prabang, and it’s definitely worth making a stop, but there is so much more to Laos than Luang Prabang. It’s all organic cafes, good coffees, vegan food, yoga and beautiful colonial architecture. It’s great if you’re looking for a retreat that has way fewer tourists than Ubud. Maybe if I was traveling with a bunch of girlfriends and we were looking for a place to relax and do a few tourist things, then I would have liked it more. We spent our first day walking around the whole town. It’s very easy to navigate, it’s super small and there are tons of beautiful temples to visit. The Pha Bang Royal Palace Temple is an amazing museum and temple grounds worth exploring. It was one of my favorites in the city for sure. On the second, day we rented bikes and just got lost in the back streets. We pedaled up this giant hill because we saw a golden stupa from the center of town and wanted to get up close to it. It was way further than it looked and my quads hurt for days afterward. It was a great view, though. I highly recommend renting some bikes – they’re only about 2 dollars a day, and just getting lost in the area. It’s a very safe place and Laotian people are incredibly kind. Here’s the temple we rode up a mountain to find. We ate at the night market every night – amazingly fresh grilled fish, sausages, chickens and tons of cheap sticky rice. There are some good souvenirs there too. Where to stay: Global Guesthouse was a great spot. We liked it so much we went back to spend a night here when we had a little pit-stop. The woman who runs the place was so nice and really helpful. Just a small place, so if you’re coming during high season, definitely book in advance. We spent one full day here, two nights. 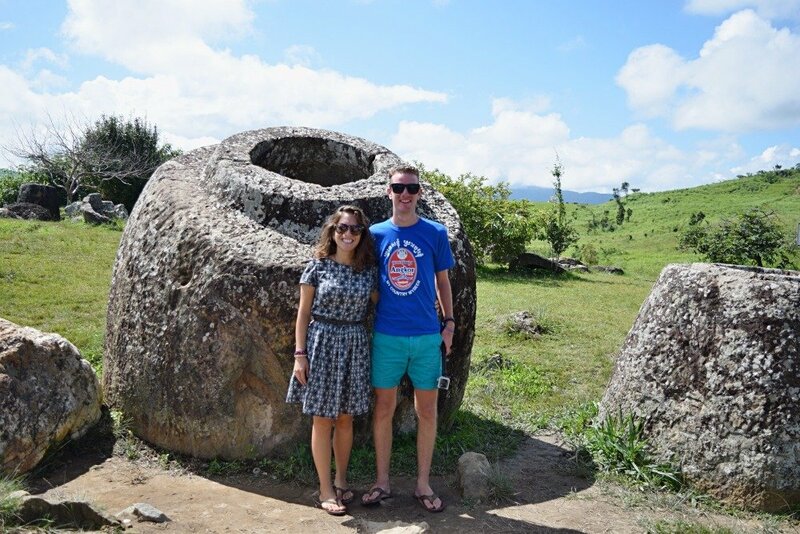 There isn’t a great deal to do here, but we were totally fascinated by the Plane of Jars and really wanted to see them up close. There aren’t really organized tours to the jars – it’s all based on interest and how many people want to do. Luckily when we were there we found a few other people who were interested in going to the Jars. Ponsavan is tiny – there’s only one street, so it wasn’t difficult to spot the other tourists in town. In total there were five of us, and we paid $20 each for the tour. It included a driver who was also a tour guide, a tour of the three main sights, and lunch. Lunch was a bowl of soup similar to Pho (in Laos it’s called Fur). Ponsavan is also a place to go if you want to learn more about the Secret War. During the Vietnam War, this part of Laos was targeted because the Americans though that some of the Vietnamese were hiding out here. Now there are hundreds of thousands of cluster bombs and landmines that are being cleaned up by volunteers. There are two excellent charities here in Ponsavan worth going into – MAG International and Quality of Life Association. Both are doing great work to educate people on these weapons in their backyards as well as assisting those that have been maimed due to their existence. You can pretty much only get to and from Ponsavan by going via Luang Prabang, so we came back here and stayed for one night. We ate tons more at the night market and we climbed up Mount Phousi, a great view point and temple in the center of Luang Prabang. I could have stayed here forever. I could live in this little slice of paradise. To get here you take a bus to Nong Khiaw, then a boat from here down the Nam Ou River. This little village is becoming more and more popular. When we were here in 2015 most places had internet, but power outages were a normal occurrence, especially after dark. I’m sure it’s only going to get busier here, but the natural beauty of the area is insane. Strolling through the incredible rice fields in Muang Ngoi. 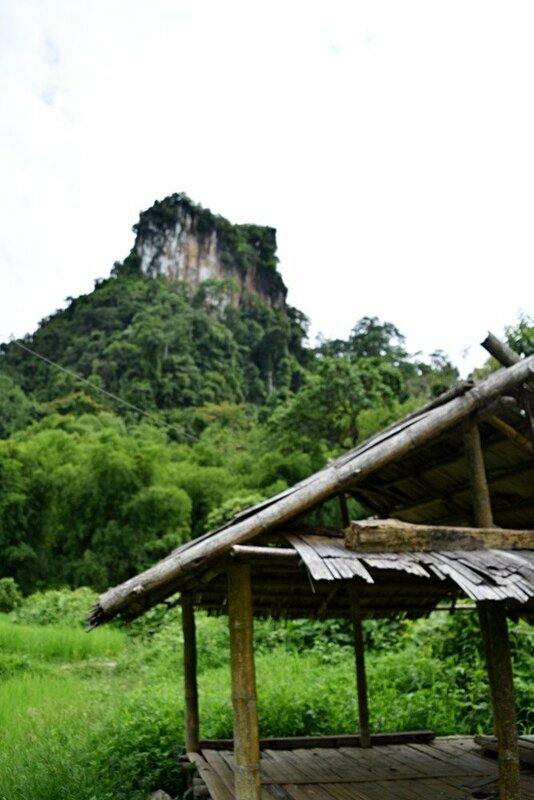 We did an amazing day hike that I found on Wikitravel, to a small village called Huay Bo. It was all stunning karsts, bright green rice fields, and a few river crossings where I thought I might contract cholera, but here I am today, so obviously not. We spent another day simply relaxing, reading, wandering around the village. You can do so many hikes and organized boat trips from here, but we simply enjoyed the view from all the river bars. Where to Stay: We stayed at this little guesthouse that is right near the boat ramp. When you leave the boat and start walking towards the village, it was the first place on the right. There are probably only 4 or 5 bungalows, but they are perfect – porches with hammocks, simple rooms and private bathrooms. We paid $3 a night. These karsts were everywhere in Muang Ngoi. I do not recommend stopping here. If you can avoid it, you should. While it makes for interesting storytelling, visiting this Chinese border town was kind of an accident. We were headed to Luang Namtha after Muang Ngoi and we wanted to avoid going back to Luang Prabang yet again. So we took a bus from Nong Khiaw to Oudomxay. The plan was to then quickly catch the last bus to Luang Namtha, but thanks to muddy roads, rock fall along the way, and who know what else, we missed that last bus. We had to spend the night. Positive things? The Vietnamese food here is insanely good. We got to have all the dishes we missed and a few Hanoi Beers for super cheap. It was a short bus journey to Luang Namtha in the morning. Negatives? 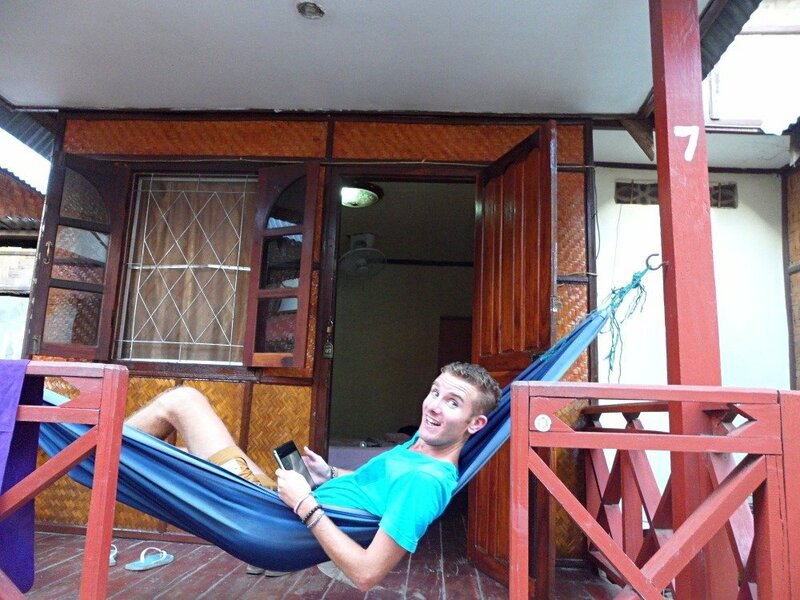 It was our most expensive night in Laos. We wandered around to tons of different hotels, most sent us away. We spent 60,000 Kip for a tiny room with a squat toilet. I mean, that’s only $7, which seems ridiculous to complain about now. The town exists as a place for Chinese and Vietnamese workers who are helping build the road that will connect Laos to China. Luang Namtha is another town I could have stayed longer in. We went there mainly to get ourselves onto a 2-3 day hike through the Nam Ha National Park. Since we arrived in Luang Namtha so early from Oudomxay, we were able to go around and price up the different tour companies and learn a bit more about the different options. When you are interested in a certain tour, the tour company will put a chalkboard outside telling others that that is the tour for the next day. The more people that sign up, the cheaper the tour will be for you. Sustainable tourism is a big phrase that gets thrown around a lot in this town. Every tour company claims to be eco-friendly and promise that they are giving back more to the local community than anyone else. I have no idea if this is true or not, but based on what a few travelers told me after their tours, a few of these places are big fat liars. In the end, we decided to do a three-day trek-kayak trip with Discovering Laos. They were very professional, our guide was amazing, and the food we ate was top notch. I would definitely recommend them. Our first day we hiked, our second day we kayaked and rafted down the Nam Ou River, and on our third day, we hiked some more. I highly recommend wearing something a bit sturdier than sneakers if you have them. I was slipping all over the place while we were up there and really wished I’d had some boots. Definitely check out the night market while you’re in Luang Namtha. The food there is excellent – rotisserie chickens, roasted duck, spring rools, noodles, soups, and plenty of unidentifiable items worth a taste test (and some not). Another great spot where I went to work on our last day in town was the Bamboo Lounge. They have really strong wifi, excellent food, really tasty coffee and they are giving back massively to the community. They make their own whole grain bread – a dream after months of baguettes. This was the best three days of the entire trip. We took a bus from Luang Namtha to Luang Prabang where we had to spend the night. Then we caught the first bus the next morning to Sayabouly. It was time to hang out with elephants. We spent three days at the Elephant Conservation Center in Laos learning about Asian elephants and the population problem that they are trying to assist with. They are the most magical animals. Basically, elephants in Laos are used and abused in the logging industry. Females and males are separated because Laotians don’t want them to mate. The gestation of an elephant is TWO YEARS. So they couldn’t afford to have their elephants not working for that long. Obviously, this means that there aren’t new elephants being born. The work for an elephant in the logging industry is quite literally back breaking. They work all day, they aren’t receiving enough nutrition, they collapse and often die very young. 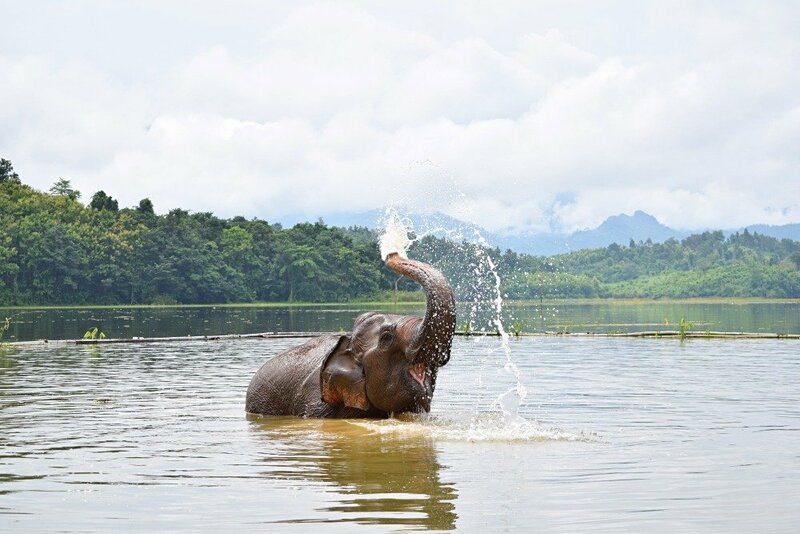 The Elephant Conservation Center wants to show Laotians there’s another way to make a living. They want to teach conservation to the people of the country and they want to help give these captive elephants a life that is more suited to the wild. We learned so much there and if you are going to be coming to Laos, I HIGHLY recommend a visit here. It was such an amazing and eye-opening experience. You can read about my full experience in this post. We took a bus from Sayabouly back to Luang Prabang. Then we spent the day at the bus terminal eating bowls of soup and drinking at a bar run by a Vietnamese couple. Then we hopped on the overnight bus from Luang Prabang to Vientiane. It was perhaps the worst sleep I had during the entire five months I traveled through Asia. We got to Vientiane at 6am and took a local bus to the center of the city. Don’t let the tuk-tuk drivers tell you that you can’t take the bus. We saved a few dollars each by taking the local bus that said “central” on it. It goes to the central bus terminal where you can walk to any of the hotels in Vientiane. 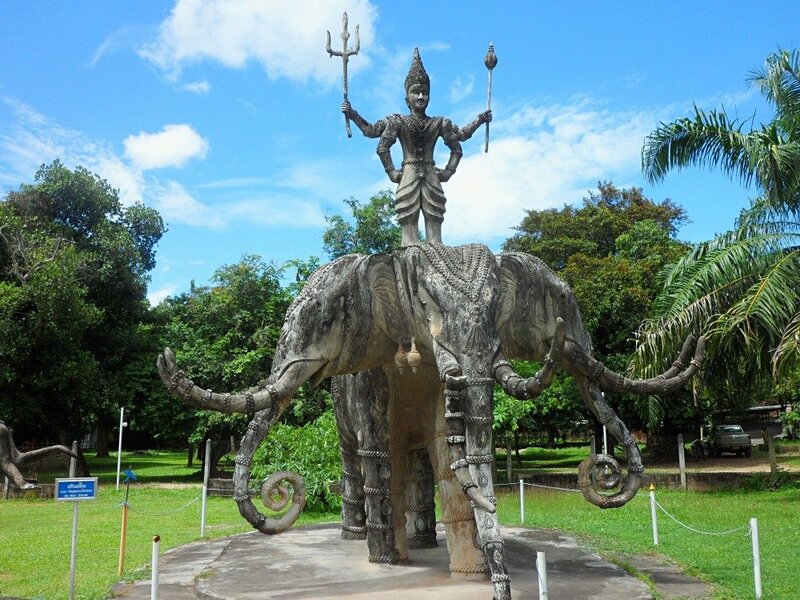 I didn’t love Vientiane, but I did love the Buddha Park. It’s a beautiful sculpture park where we spent pretty much an entire day. You take a bus from the main bus terminal and tell the bus driver where you want to get off. He’ll give you a shout when you arrive. When you want to head back to Vientiane, just cross the street and hail the bus when it comes in the other direction. I really enjoyed the night market here along the river. There are also some great seafood restaurants at the end of the pier. Cheap beer and really reasonably priced grilled fish. Plus you look out over the Mekong at Thailand. Where we Stayed: Thawee Guesthouse. It was pretty good – VERY cheap. I liked it’s location – a little away from the backpacker street, but around plenty of restaurants. They helped organize our bus south for a reasonable price. It wsa perfectly clean and comfortable. 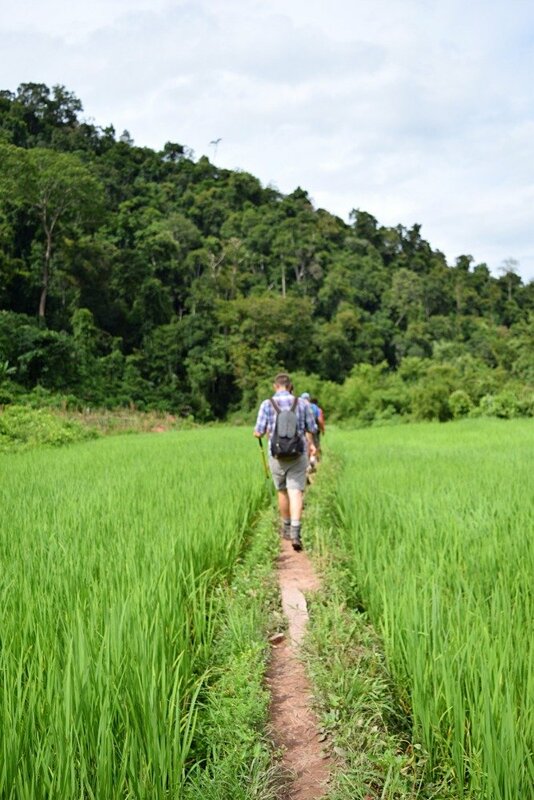 We used Pakse as our base to explore the Bolaven Plateau. We were kind of running out of days. If we had more, I would have spent a lot more time in the Bolaven and spent nights on the loop instead of back at Pakse. It’s not a bad spot to base yourself, though. We stayed in the center and actually had some really great food here. Grilled meat was everywhere, coffees were delicious, breakfasts were cheap and people were really friendly. We arrived on an overnight bus from Vientiane and got a tuk-tuk from the station to the center of Pakse. Once we dropped our stuff off at our guesthouse we found a place to rent a motorbike and headed off to the Bolaven. We took a wrong turn and ended up doing a 30 km detour, but what a beautiful part of the country it was! Travel Fish was an invaluable resource during most of our trip through Asia, but I really looked to them when we did bike tours like this one. 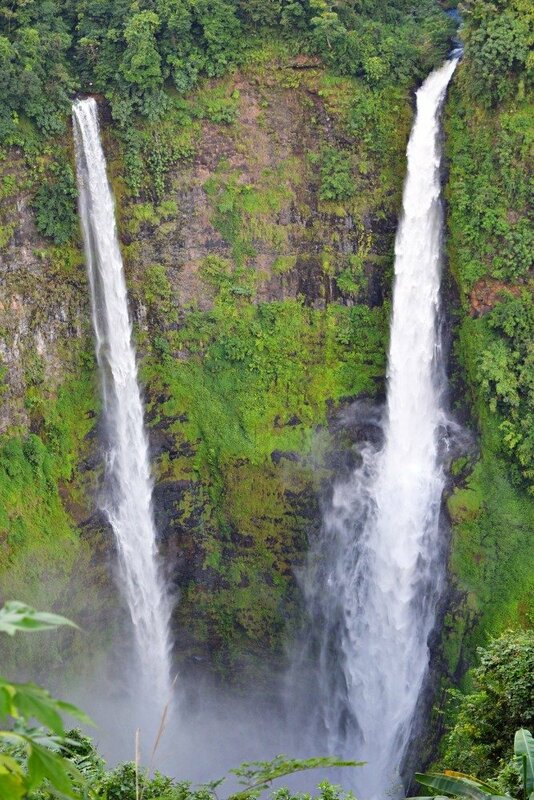 We pretty much followed their one-day tour advice and hit up as many waterfalls and coffee plantations as we could. The waterfalls were incredible, but so cold for the time of year we were there. We swam at the base of one of them and it was freezing! 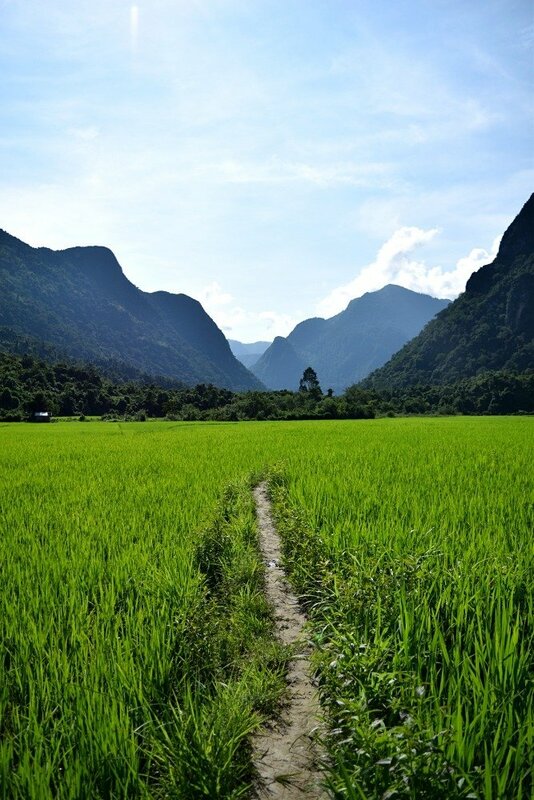 You could easily spend a few days in the Bolaven hiking and exploring more of the natural beauty. There are tons of guesthouses here and they all run tours that take you into the jungle. Where to Stay: We stayed at Sabaidy 2 Guesthouse which was perfect. They are by far the cheapest place we found in the area. We had our own room, there are tons of showers and toilets so you never have to wait. The guys who run it were really helpful and gave us a map before we headed off on our bike tour. What a place. We meant to island hop, but we just loved where we were staying so much. We loved how quiet the island was because it was low season and riding bikes all day and sipping beers along the river every night. I can see why so many travelers get lost here in the 1000 Islands. We spent our first day doing mostly nothing other than wandering the village and getting out bearings. Our second day we rented bikes and rode to Don Khon, the neighboring island. You pay a dollar to cross the bridge and it includes entry to one of the major waterfalls. We also took a boat ride here to see the river dolphins that live here. You can simply ride bikes to the end of the road in Don Khon and pay a few dollars to take a boat tour. They charge you a small fee because you enter into Cambodia for a minute before crossing back into Laos. The dolphins were really cool to see – they’re a unique breed to the Mekong. We laid in our hammocks on the balcony of our guesthouse, we thought about taking a kayak tour, but read our books and relaxed instead. We rented bikes again, watched the sunset a lot. I think I finished two books while we were here. It’s just that sort of place. This Wikitravel guide was pretty helpful while we were there. We went from Don Det straight to Champasak and there was one guy from a guesthouse waiting to get some business when we arrived by boat (tell the bus driver you’re going to Champasak so he drops you off at the pier). It was a great spot with good food and friendly people. I also recommend Saythong Restaurant for a meal – they made amazing grilled fish for us one night and the staff were SUPER friendly. We came to Champasak for one reason – to see the Wat Phu. 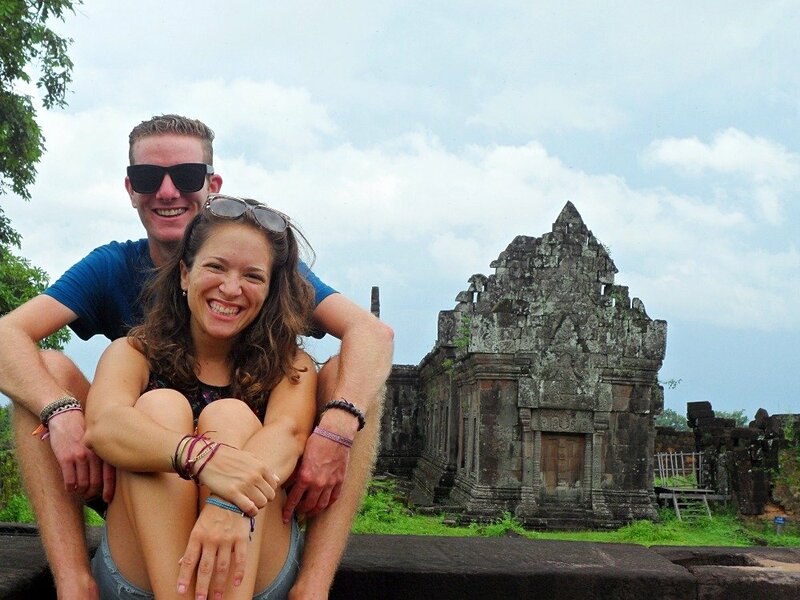 These ancient Khmer ruins were high on our list and they were absolutely incredible. One of the many buildings still intact at Wat Phu. Thanks to traveling during the wet season we had the place mostly to ourselves. We took our time, stopped for lunch nearby – a cheap bowl of soup, before heading back in to explore more. If you are interested in history or Khmer ruins or a bit if beautiful scenery, I highly recommend checking it out. We cycled back as the clouds were getting dark and about 2 minutes before we made it back to our guesthouse the sky opened up. I don’t think my clothes dried until I was back in Thailand. Our last day in Laos was spent buying a few last minute souvenirs, eating more sticky rice, then sitting on a bus to cross the border back into Thailand. It’s always easy to look back on an itinerary and critique, but we just loved so much of Laos that we stayed in some places a little too long. I would have skipped Vientiane. It just wasted worth my time. I would have rather used that time in the Bolaven Plateau exploring nature. Maybe I would have spent a bit less time in Don Det and explored more of the 1000 Islands. There are so many little-deserted places, so many little parts of the Mekong that I wish we’d explored a bit more. Don Det was amazing, so I bet I would have loved the isolated islands even more. I wish I had planned ahead a bit more and planned out our route at the very beginning. Because we were kind of just winging it as we went, we spent a lot of money backtracking to Luang Prabang and spending nights in places that we didn’t even really want to be. I think spending a little bit of time when you first arrive, planning the route you want to take will save you time and money during your stay. Laos still has a very high possibility of Malaria. While we didn’t take any malaria tablets during out 30 days, we met a lot of travelers who did. We were VERY cautious about mosquito bites here, especially when we were in the jungle areas up north. Bring jungle-strength mosquito spray and wear long, light-colored layers. Apparently, mosquitos are attracted to DARK colors. As always, insure yourself and your stuff. Laos is a very remote country and if you need medical assistance, you’ll definitely want to be insured so that you can be brought to Thailand in case of emergency. I always recommend World Nomads. I’ve been using them for over six years and am always happy with the service and price. Laos is such an incredible country. If you are planning to explore South East Asia, I highly recommend adding Laos to your list. It’s often left off people’s South East Asia itineraries, and it deserves as much time as everywhere else (in fact I could easily spend MORE time here than most other places).